The electrical vacuum generator ECBP from J. Schmalz is ideal for handling airtight and slightly porous workpieces. It features an integrated speed control, which regulates the power of the pump to suit the process or workpiece. Moving porous workpieces, such as cardboard for example, requires considerable suction capacity and thus considerable energy. Airtight materials, on the other hand, require less power, meaning the user can reduce the speed. This degree of flexibility makes the vacuum generator extremely energy efficient. 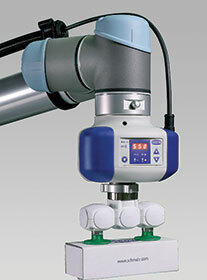 As the vacuum is generated without compressed air, the ECBP is particularly useful in mobile robotics, and its fully automated small parts handle just as well for stationary handling tasks. Different grippers from the Schmalz VEE modular system can be attached simply and easily via integrated flanges. Connection to lightweight robots from different manufacturers works in the same way. Via the data interface, the ECBP provides users with energy and process data via IO-Link from the machine to the cloud. The condition monitoring function recognises deviations in the vacuum supply, for example, thus reducing faults and downtimes. Furthermore, the user has various options for adapting pump capacity to the handling process. The ECBP can be parameterised directly on the device, using an NFC-enabled mobile terminal, or via IO-Link in the control centre, for example. Thanks to the plastic housing, the gripper weighs just 700 g and is designed in such a way that there are no interfering contours. The electrical connection to the pump is established via an 8-pin M12 connector. The maximum suction capacity is up to 12 litres per minute at a maximum current strength of 0,7 A.